270 holes. Seventy seven miles walked. Seven like-minded guys. Five amazing caddies. Two Hundred Hole Hikes. Two world class golf courses. All for two great charities. All in eight days… and what an amazing eight days it was. 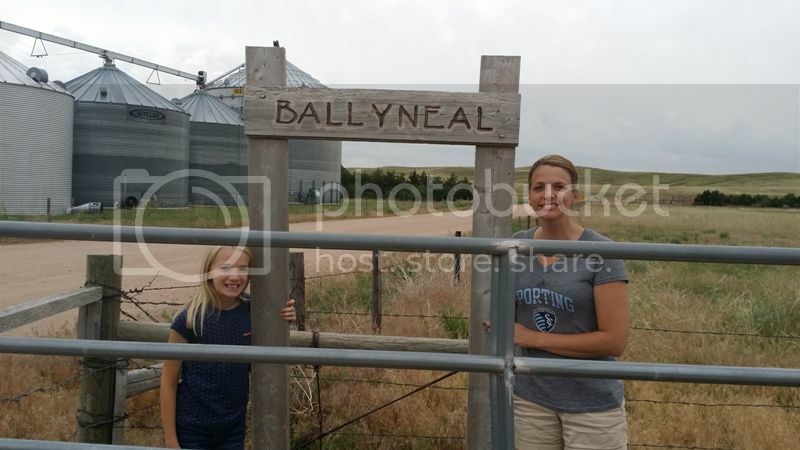 I was lucky enough to be able to bring Julie and Grace along with me to Ballyneal Golf Club, the home of the Hundred Hole Hike, in Holyoke CO, for my first event of 2014. Not only was I excited about them being there to support me and the other guys, but also for them to see one of the places that I rave about over and over again. 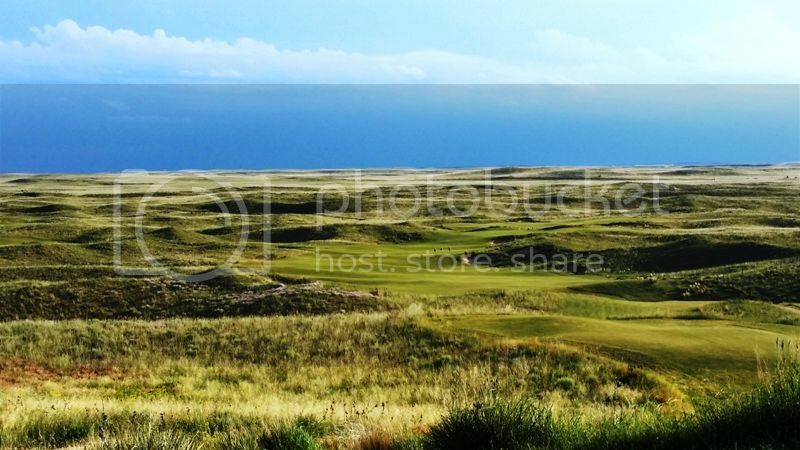 Ballyneal did not disappoint. Grace’s days were spent with new found friends, discovering turtles and frogs and snakes and lizards and rabbits, and pestering the club cat, Bunker. Julie loved the sunshine, food, and peaceful, laid back atmosphere. 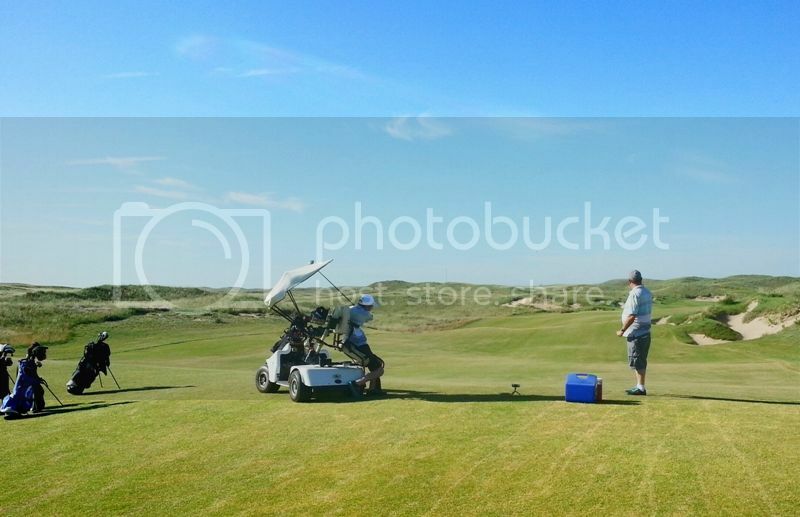 The day before the Hike was one of the best days I have ever had on a golf course. 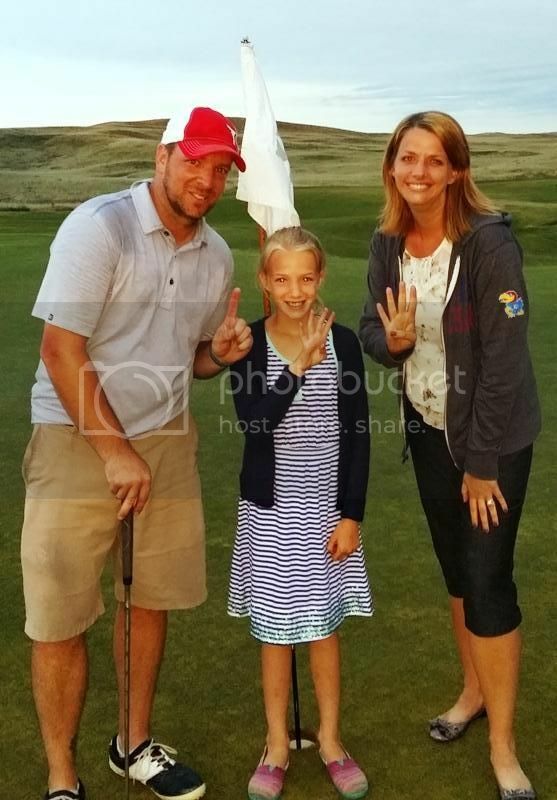 Ben Cox, a former caddie at Ballyneal and the inspiration for the Hundred Hole Hike after being paralyzed in a skiing accident four years ago, was going to play the back nine in his specialized cart for his very own fundraising Hike. Jim Colton, Matt Schulte, Matt Sander and I had the honor of teeing off with Ben on Sunday morning. 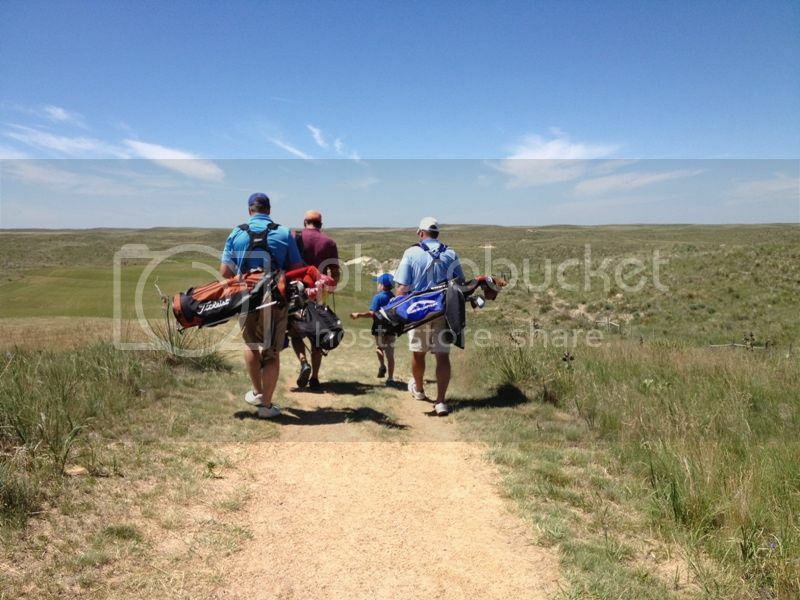 After hitting our tee shots and watching Ben blast one down the middle, the four of us headed out in front of Ben. As we made our way down the 10th fairway, I don’t think there was a dry eye to be found. Only Jim commented, saying “Man, it’s getting dusty in here.” It was so amazing to see the love of his family helping him along the way and the determination he had to accomplish his goal for the day. Nothing like a little perspective bright and early in the morning and just another reason to love this game. Unfortunately, Matt Schulte had to take off after 9 holes, but on the bright side we were joined by Luke, Jim’s youngest son, for the front 9. This kid is amazing (except that he hits the ball from the wrong side). He loves the game and I learned so much from watching him and his dad. Patience, love, encouragement, competitiveness, and fun. All great things to be reminded of prior to a long day of golf. After a great dinner with all of the guys and families it was time to get some rest for the 4:00 a.m. wake up call. As I fumbled around in the dark trying not to wake up the girls, thoughts about the upcoming day were the only thing on my mind. I was pretty excited (mostly nervous) about this Hike. Seven other guys were there to raise money for their charities. How many times would I get lapped? How bad would the golf be? Along with the question that arises every year: Would I be able to get to 100 holes? Full disclosure: other than the occasional pick-up basketball game or two mile run, I had not done anything to get ready this year. Luckily, I had a good friend volunteer to come out and lug my bag around for most of the day. Ross Harmon, you are amazing. More on him later. 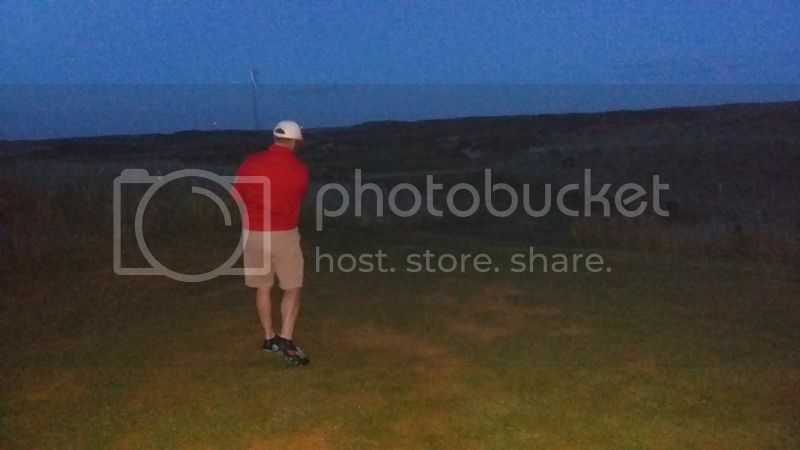 We teed off at 4:50 a.m. and as you can tell, it was still a little dark. We moved along quickly, while not playing the best golf. After about 3 holes, Ross knew what club to hand me, told me where to hit the ball, and found the ones I didn’t hit where he told me to (which was often). All while keeping my scorecard and keeping me hydrated. Julie and Grace joined us for the front 9 of rounds three and six with Grace playing the part of “putter caddy” and Julie being encouraging and taking pictures of the day. It was so great to have them there. By 3:15 we hit hole #100. A couple of high fives with Ross and the girls celebrated the moment and we were off again. Ross is also one of only five or so people to join the exclusive Hundred Hole Caddy Club. He carried my bag for the first six rounds of the day. I can never thank him enough, not only for caddying, but for watching some of the bad golf, too. He retired after the 108th hole for the way more appealing draw of a shower, beer, and air-conditioning. A quick text was all it took to get the girls off of the lodge balcony and over to the 9th green to pick up the bag. It was a great nine holes having them follow me around and Grace even found a new friend. So who in their right mind could stop playing golf? I figured I had just enough time to play 144, 8 full rounds, so the new goal was set. As I got to the back nine a thunderstorm could be seen moving in from the distance. The pace got a little quicker. As I stood on the 18th tee in almost darkness, I couldn’t help but smile when thinking about the last couple of days. As I scuffled my way up the 18th hole to the tune of an 8, I couldn’t help but hope it was over soon. As I reached the green and saw my family along with other Hikers and their families, I couldn’t help but smile again. And upon receiving a couple of huge hugs from Julie and Grace after the 144th hole of the day, I couldn’t help but remember what this day is all about. Like I said earlier, the golf wasn't great, but the day was. A low score of 79 and a high score of 97 with a bunch of other numbers in between. 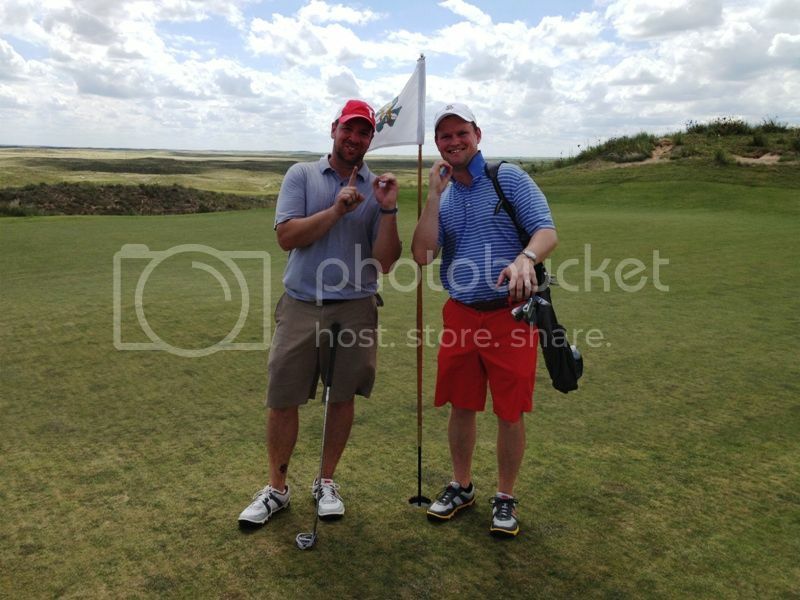 Five birdies on the day added to the amount raised.